Baby Monogrammed Bib, Custom Made in Various Toile Fabrics. Home > Babies & Infants > Bibs & Burp Cloths > Baby Monogrammable Bib, Custom Made in Various Toile Fabrics. These wonderful monogrammable bibs match our toile burp cloths. Each bib starts with your choice of fabric and is made in your choice of size; either infant or toddler. 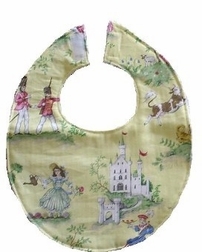 The bib is then backed with a soft, fluffy chenille/fleece type fabric that is very absorbant. The bib is completed with a velcro closure. The infant bibs come in the round shape, and the toddler bibs are square to allow for more coverage of clothing as the child grows. As this item is custom made, please allow 3 weeks for you to receive it.